here is a recipe to celebrate the weekend. this is one of my favorite banana recipes i’ve made. the best part? no flour/oil/butter but you can’t even tell! make them for breakfast. you won’t regret it! 1. Preheat oven to 400 degrees. Spray tin with non-stick cooking spray or line 12 muffin tins with silicone or foil liners. 3. Divide batter among cupcake liners, and bake for 15-20 minutes, or until toothpick comes out clean. 4. Most importantly: Enjoy & try not to eat them all at once! husband ate 4 in the first ten minutes after they came out of the oven..
on the last one he even added his own topping: nutella! smart guy. *UPDATE: read through the comments below if you’re going to make these! there are some great tips for substitutions and variations to make these gluten-free, etc! as you can see in the pictures, i’ve made them a few different ways & they’ve all been great! Love that there’s no flour in these which means I can enjoy them without substituting something! :) Thanks for the recipe! perfect! yes i love that they have no flour…and i’m glad that works for you! you have to make them..
Yum, I was reading the recipe and thinking my husband would put nutella on them and then I saw your husband with the nutella… too funny! haha, i love that! looks like our hubby’s were meant to be friends. hope you try these! You’re so creative and a big inspiration. Love this, nice job! they seem healthy to me + if husband scarfed down 4 in 10 minutes, i’d say we need to give these a whirl. i think we’ll top ours with whipped creme + raspberries. because, why not? yum, i want the bran muffin recipe! Oh yes I’d love the recipe too! I love the ones from Cracker Barrel! Just wondering if you tried adding the protein powder and how it turned out? Can I substitute regular yogurt for the greek yogurt? I used vanilla greek yogurt and it had amazing flavor! Yay I just realized I did not get GREEK and I was concerned. Can’t wait for oven chime now! I actually used regular vanila yogurt and they turned out amazing! yes- that’s the best part! we froze a few and popped them in the microwave in the morning for some on-the-go breakfasts! Hi, great recipe, we love them. I don’t know where you live, but I live in western Canada, and I baked them for 20 minutes, which was way to much. I found that 12 minutes was just perfect. Thanks for this great treat. oh, interesting! we live in california so maybe the altitude makes the difference..thanks for letting everyone know! 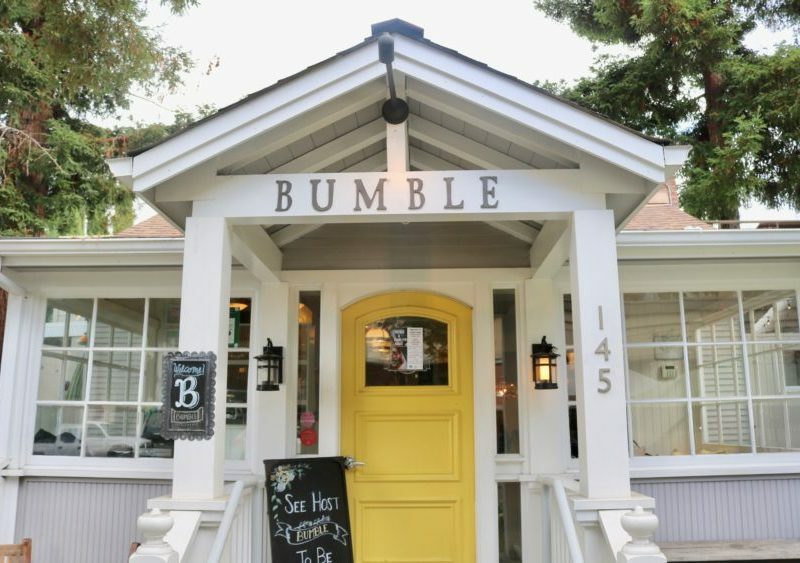 could you use 1/2 cup honey instead of the sugar? yes, definitely! they would just have a little bit of a different taste but they would work! Just want to say that I even made these with infant baby oatmeal for my 1 year olds and they still came out AWESOME.. Great breakfast for the kiddos! I used maple syrup. Very good! What is the calorie count for these delicious muffins? I added an extra banana and used a little pumpkin pie spice and a tad bit of honey. I also ground up flax seed and hemp seed to mix in with the oats for an extra protein boost. We LOVE these muffins – so simple and healthy! I am allergic to wheat and I was so excited when I saw this recipe. It’s hard to find good wheat-free muffins that don’t taste like paste! I left the sugar out and I didn’t even use a food processor and they still turned out fantastic. Will definitely be making this a lot. I’m probably going to steal Alicia’s idea and try adding a little pumpkin too. you left the sugar out completely, and didn’t even substitute anything? impressive! might try that! Erica – have you tried King Arthur GF Muffin mix?? It’s just the mix, you add your own berries or chocolate chips. They are sooo tasty! I just found these on pinterest so I’m late to the game but I also thought the sugar was unnecessary- I ended up adding 1 tbsp after debating whether to add any at all and they were more than sweet enough. Will make them without any sugar next time. Good recipe though! Thanks for sharing. Hey! just wondering how many the recipe makes? Want to know if there would be enough to freeze..
I’m sure you’ve tried by now, but when I made it, I got 18 and we froze what we didn’t eat. They aren’t as fluffy after the cooling/freezing, but they are still fantastic! If I dont have baking soda, what can I use in it’s place? Just put these in the oven. Modified it a little because I had no yogurt. 3/4 cup milk and 1/2 apple sauce. Also threw in some honey. Fingers crossed that they are good! I made these today and they rose perfectly in the oven, but when I took them out they sunk down into the paper cupcake liner…..the only variation I did was Agave instead of sugar. The center is not real fluffy/airy like a typical muffin, its moist and sticky…..is that normal? This is the first time I’ve made a muffin without flour. Thanks! oh shoot! no, they are usually fluffy and have the texture of a normal muffin. maybe it was the substitute? sorry! when they fall after taking them out of the oven, that means you undercooked them! better luck next time! Try using 1/2 sugar, 1/2 agave next time… agave nectar can be moody. Do you put the sliced bananas on top after they are baked? yep i just put them on as a little garnish when i took them out of the oven! Anyone used steel-cut oats to make them gluten-free? Just curious before I try them….sound yummy! I made them with steel cut oats and they came out just fine. I had made them with regular before and can’t really tell a difference. I just made them with steel cut oats. Maybe I should have run the oats through the food processor by themselves before I added the rest of the ingredients because the oats didn’t really get smooth and I was worried that I would blend the egg too much and the muffins would come out tough. The flavor is great (though next time I think less sugar, more banana) but the texture is a bit grainy. YUM! that sounds amazing..we might have to try that version this week! May I know when you replace with pumpkin, are they raw pumpkins? Just add in raw pumpkins & blend till smooth? These are SO good! I’ve made a habbit of reading all comments for tips on new recipes & I’m super glad I did for this one! I saw someone in Canada said to only bake them 12 mins, and that was a great starting point for me here in WA! 15 mins was perfect!! GREAT RECIPE!! Just thought I’d add my $.02 as well….these are just PERFECT!!! Not to mention so freaking easy to make and modify here or there if you wanted. LOVE IT!! PS: used vanilla Greek yogurt and added a tad of French vanilla extract and cinnamon…Yum! Recipe sounds delicious! Any ideas on what to substitute for the greek yogurt so that these could be dairy free? Wondering if almond milk & applesauce would work…. we made it as written. except we used a mini muffin pan because that is all we could find… they were delicious! yum! we love mini muffins..good idea! Wondering if you have to put everything in the blender/food processor. Could I just mash the banana and use an electric mixer? yes, of course you can just use an electric mixer! Is that 2.5 cups of cooked or uncooked oats? Mine don’t look anything like the picture that you have! :-( You can still clearly see some of the oats, maybe I didn’t blend them enough? I blended mine on “crush” level 5 for a good minute or so until the mixture looked like flour. I’m not sure what happened with these, but mine didn’t cook through all the way. After almost 20 minutes, they are still gooey. My batter didn’t get very smooth. Could that be why? I’m so glad there is no four!!! It means BOTH my Dad and brother can eat these without getting sick!!! 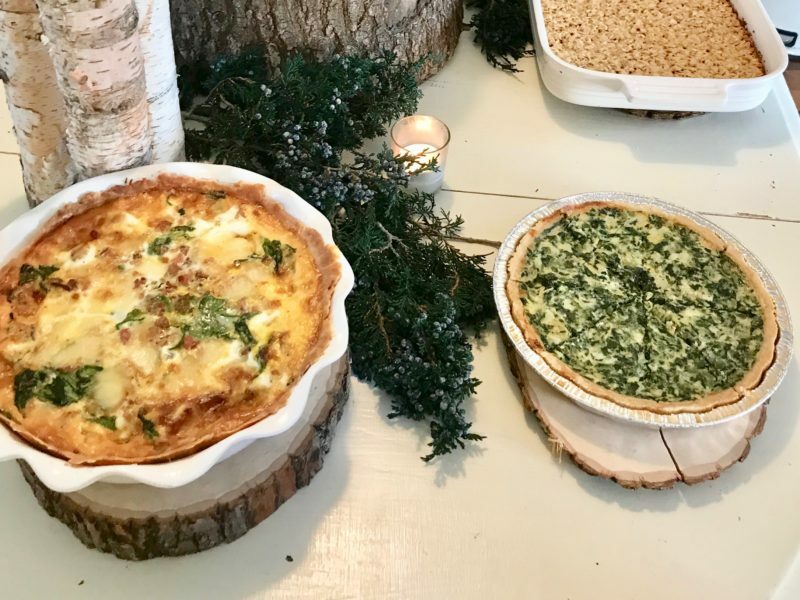 (LOTS of food allergies in my family) thank you for posting! November 9, 2012 @ 4:43 pm Desarae S.
Just put them in the oven. I had to substitute the baking powder because it has corn in it and my husband is allergic. I’ll let you know how they turn out! They smell delicious! thanks, i will try the rice flour myself next time, my husband loved them and ate 3, now that is a ravin endorsement, !!! Just did them. I get it why these muffins need to be served hot…. I am not going to lie and say those are the best Ive ever eaten, but they are healthy and I am having my snack fix after my gym and it is hitting the spot. to the person who used baby oatmeal cereal to make for 1yr olds…how much of the baby cereal or did you use the same amount? Have you made the regular version and if so is there any texture/consitancy difference or cook time adjustments? Any idea on how many carbs per muffin? (daughter is a diabetic) Thanks! These are wonderful! I followed the recipe exactly, baked for about 18-19 minutes and they were perfect and golden. I think the baking time must be influenced by location, altitute and of course, your oven because fewer than 18-19 minutes would have left the undercooked (I’m in WNY). I really like the idea contributed by someone above about using chocolate Greek yogurt or any flavored Greek yogurt. Looking forward to making these again with some experimentation! 2.5 cups of uncooked oats? Yes, dry oats. Put them in your blender to smooth them out. After some blending, they are pulverized and the mixture looks like flour. How long would you reheat them in the microwave both normal and frozen? I made these last night. I only had 6 oz of greek nofat plain yogurt, so I used an extra half banana. Then I used splenda baking mix in place of the sugar. I added a sprinkle of cinnamon. I baked mine for 15 minutes and they were done. They were really good. Mine puffed up so they weren’t flat. I used milk instead of yogurt and 2 cups of reg oats and 1/2 cup of steel cut oats and the texture is wonderful. I also doubled the banana my toddler ate 2 straight out of the oven. love hearing those tips! thank you! Has anyone tried freezing these? I’m due with baby in a couple weeks and compiling list of things to pre make and freeze so I can still have healthy things to eat without all the work when she gets here! sorry to reply late, but we froze them and they worked great! Ended up using vanilla Greek yogurt and didn’t quite have enough so I added some applesauce too. I also added some shredded coconut and they turned out delicious! I only food processed the oats and used a pastry blender to mix the other ingredients together. Ended up with some larger pieces of banana but they were a great surprise…great texture. good to know about the applesauce substitution, and coconut sounds amazing! thanks! Love this, saw it on pinterest and have been making it every week, I added choco chips, walnuts, chia seed and sometimes peanut butter to mix it up. So easy, so delicious. I used applesauce instead of yogurt so it’s dairy free. Turned out great! great idea! we will have to try it that way now! I made my first batch with paper muffin liners, and they sunk in the middle after they came out of the oven. I used foil liners for the second batch, and they came out perfect! For those who had baking troubles, try foil liners instead and see if it helps. just put them in oven.added chopped walnuts and used strawberry greek yogurt. Hope they are good. I’ll report back. Oh yeah on 6 0f them I topped with dove chocolate. Those are mine. I made these this morning with a few modifications. I will be blogging about my experience and will link the original recipe to your blog (this link). It’ll publish in about a week. My blog: http://www.iconveyawareness.com. Great idea. Mine came out great without the use of any liners. Tasty! that sounds great! can’t wait to see the modifications..thanks for your comment! It published today. It’s also on my Facebook page: Conveying Awareness with Jessica David. I didn’t see that you had a page. If you do, come find me so I can return the like. Add a tsp. vanilla extract and a tsp. cinnamon. Extra delicious. I just finished making these and they are amazing, such a great alternative. I mixed some honey and greek yogurt together for the top and they were wonderful! introduced to your post. They are really convincing and can certainly work. Still, the posts are too short for novices. May just you please prolong them a bit from next time? Thank you for the post. I made these tonight and they are yummy! Sub’d ~1/4 cup Truvia for the sugar and used ~1/3 cup coconut flour in place of some of the oatmeal. Only took 13 minutes in my oven, and I’m in California too (I think my oven tends to run a bit hot though.) 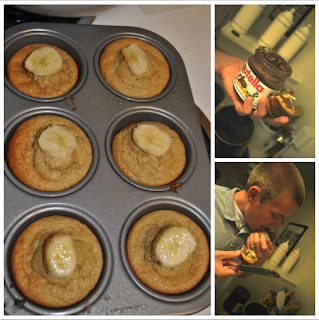 Thanks for the recipe… These are delish and I can’t wait to eat another one in the morning with my coffee! in the beginning, did not work properly with me after some time. event you can accomplish that, I would certainly be impressed. January 3, 2013 @ 12:51 am . i was already thinking about trying these, and then i saw you’re a chi o, and now i definitely will! :) chi o love and mine! love that! chi o until i die o! I tried these today but mine didn’t turn out. I substituted the sugar with a 1/2 cup of honey. Not sure if I added too much…I even baked them longer than 20 minutes and they are still gooey in the middle (oatmeal consistancy) Thanks for any help.. I was super excited for these..
shoot! i think the consistency of the honey might have made them have a harder time setting up! Anyone tried egg free? My son has an egg allergy . If I don’t have a cup cake tin can I use a square bread pan and make bars? Has anyone done something like this? Thanks! can quick cooking oats be used in place of old fashioned oats? I made these but didn’t have yogurt so I substituted half sour cream and half buttermilk. They came out great. I made them a second time (the next day because they went fast at my house) but substituted some honey for half of the sugar. They didn’t rise as well and had a dryer texture but my 3 year old still ate them! Yay we’re so glad! YUM! Has anyone subbed egg whites for the 2 whole eggs? These sound delicious but I only have egg whites on hand! DO you think they have a lot of calories/fat? The lack of flour might mean they have less? I hope so!!! I just made these tonight…I’m very pleased with them. I tried a batch with no liners, and have a batch in the oven with paper liners. Just curious…this made a LOT of batter! What is the best way to reheat them?! Thank you!! My family really loves these muffins. I have made them three times with great results. I have reduced the sugar to 1/4 c. brown sugar and 1/4 c. maple syrup and added blueberries or strawberries. I’m so glad I found an oatmeal recipe in disguise. Great for my son who’s not a big oatmeal fan. YUM- we will have to try those substitutes!!! thanks! What is a good substitution for the bananas? How long do these stay good for…..and do you store them in the frig? Love these! I used nonfat plain greek yogurt, added cinnamon, and vanilla. I used honey, but did not measure, only squirted some in. I probably added 2 TB? These are so delicious!!! Thank you!! Adding chopped pecans makes the muffins rise more. I also put a whole pecan on top (before baking). Yum! Everybody loves them, especially the son who can’t eat wheat products. Thanks! Made a batch last night and used organic Sucanat brown sugar instead of sugar, added 1 tsp pumpkin pie spice and 1 tsp vanilla. The only change we thought was will add 1/2 tsp salt next time. I also want to try these and sub applesauce for bananas and add some cocoa for chocolate applesauce. I used gluten free oats and so thrilled to find a gluten free muffin that tastes great and has normal texture. January 30, 2013 @ 5:35 pm Monica E.
I’m not an oatmeal lover (in fact, I hate it) but one of my goals this year is to overcome my oatmeal phobia so in search of oatmeal-friendly recipes, I came across yours. I’m so glad that I tried it because the muffins are delicious! I added an extra banana and blueberries and sub the sugar for Nectresse. I’m sure my hubby & kids will LOVE these as well! Thank you for sharing!! I used the base of these muffins to make apple muffins! 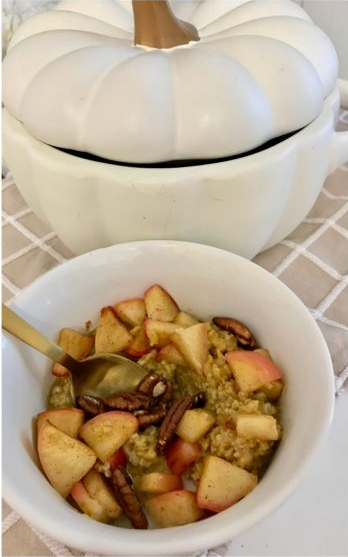 I reduced the amount of oatmeal and added 1/2 cup of oat bran for extra fiber, substituted bananas for fresh apple sauce and 1 tsp of cinnamon. I also sprinkled some brown sugar, oatmeal and cinnamon on the top. Yummy! I want to make these and surprise my hubby in the morning as he goes to work. I know he would like them just as they are but I read that someone added peanut butter. How much do you add? I don’t want it to be over powering and can still taste the banana. Also wanting to add walnuts. Thanks for a healthy tasty muffin! Update. Just went downstairs to make these while hubby was sleeping so they would be ready for him in the morning. I followed the recipe but only had 6 oz of regular yogurt and filled the rest of the cup with applesauce. Put in a half cup sugar instead of 3/4 cup. It made a lot so filled the cups full. Did not rise well. Was not fluffy but dense and grainy from the oatmeal. I did grind the dry ingredients first to make sure it was ground up well. The flavor was lacking. Yes I know they are healthy but barely any flavor and depth. I put chopped walnuts on top for a little crunch. Really disappointed in the results I had. I couldn’t eat even one. I’ll wait until they cool and taste again. 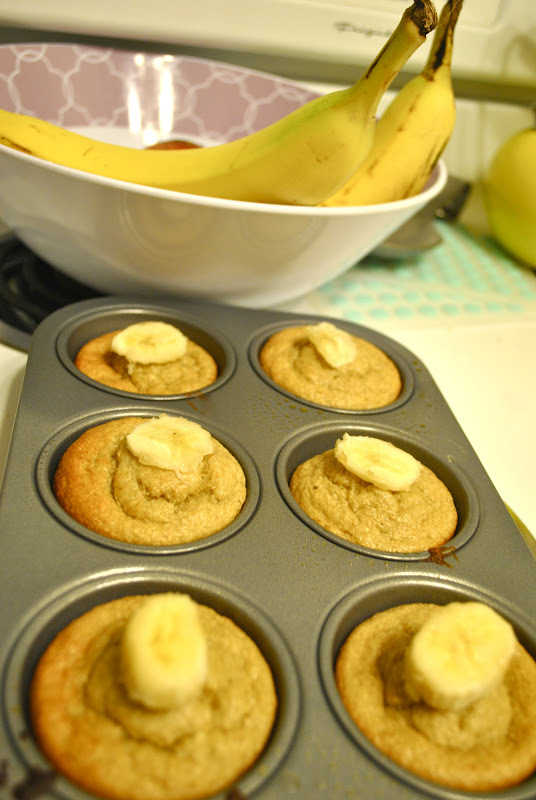 I made these this morning using greek yogurt and 3 bananas that I needed to use. I added a bit of salt to them and used the liquid sucralose as sweetener. I did add a bit of milk to thin the yogurt I had which was very thick. And I added a tsp of vanilla. THey are awesome!! Delicious!!!! Jana, maybe your baking powder has gone bad? Also, I ground up my oatmeal to flour before I made these. Then I poured it out into a measuring cup and put the liquid/banana/eggs in first, then added a little bit of oats at a time. I have made these twice now and love them. I added 2 tsp. cinnamon (love cinn.) and some chopped walnuts. Delicious!! I have used blended oats as my “flour” before and so I have oats that are already ‘pulverized’ into a flour. Do you know how much oat flour to use…I can figure out how much 1 cup of oats turns into if I need to… Thank you, I’m looking forwrd to trying this recipe! This recipe looks like heaven to me. Quick, simple and does require the use of too many dishes. Love it! Found these on Pinterest and made them this morning. I used Quaker Cinnamon flavored Simple Portions oatmeal & ground it into a fine powder with my Bullet blender. Next a used the Bullet to blend bananas and yogurt until it was creamy. I was out of baking powder & soda so I used 2 tsp of Bisquick instead. I used stevia in place of sugar. I baked them for 18 minutes and they came out perfect. They weren’t very sweet, so i drizzled organic honey over the top. I’ll probably add a bit more stevia next time though! These just came out of our oven. My Man LOVES them. used just 1/2c sugar and had only 1 1/2 bananas. Oh, and my yogurt was full-fat and i had only about 1/2c (cut it with some 1% milk). Can’t wait to try these with cinnamon, vanilla and nuts! Made these last night for this weeks breakfasts…. added pecans & almond extract :-) They’re so good! I made the muffins for breakfast this morning. Our 4 year old son ran down the stairway because there was a “smell of muffins” in the house. He had THREE for breakfast !!! I even provide it on my blog. These are delicious! I added 1/2 coconut flour for 1/2 of the oats because I had some to use and they are so good but it brings up the carbs & fat content. Next time, I will omit the coconut and make with oats only. This is perfect for me right now because I am on a semi-soft diet due to oral surgery and I love eggs but wanted something else for breakfast! Great recipe, Thanks!!! I had mine in the oven for 30 min and the middle was still really soft/wet and looked uncooked to me. I fallowed the recipe exactly the way it is written… The muffins are golden on the top, they look fully cooked, but is the middle supposed to be soft and wet looking? I still ate them. They are SOOO delicious! but I dont know if it is raw! help? Hey there! I just used your recipe to inspire my breakfast this morning. I’m going to blog about it and wanted to me sure you were aware. I hope that’s okay. If it isn’t, please let me know and I will immediately take down the post. Thanks for sharing your recipe! I tried these today and they won’t get done…the temperature was too hot. The insides won’t get fully cooked. I just made these. I did 1/4 cup coconut palm sugar, strawberry greek yogurt, 1/2 tsp cinnamon and 2 flax seed “eggs”. They turned out great! Thanks! Hubby said the muffins needed a pinch of salt. I agree and will add some pumpkin spice and use vanilla yogurt next time. Textures was a little on the chewy side. I think I will process the oats alone first next time. I have made these twice now and they turned out perfectly. My daughter must eat gluten free and this is the perfect recipe for her. I used a little less sugar and they were plenty sweet. I also used regular plain yogurt. Can’t wait to try out different variations. I think this is now my “go to” gluten free muffin recipe to which I can add other ingredients like pumpkin or zucchini! 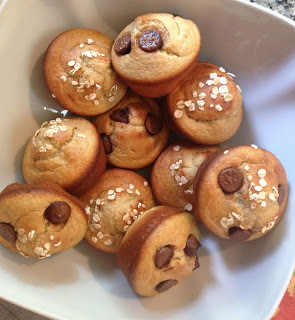 If you want healthier muffins or gluten free, definitely try this one! You won’t be sorry! Stay up the great work! You already know, many persons are searching around for this info, you could help them greatly. I wonder if oat bran would work in place of the oatmeal…. Any thoughts??? For those having trouble with the consistency – I found it best to grind up the oats by themselves, then combine all the dry ingredients in one bowl and the wet ones in the other, and then add the wet to the dry and mix them by hand. I made these today with a slight modification (I added 1 tbsp of vanilla extract and 1 tbsp of cinnamon sugar) and they came out nice and moist and peaked in the middle as well (this is why they need to be baked at 400 degrees). I’m going to use the base of this recipe (minus sugar and using egg whites instead of whole eggs) again and again. So fast in my food processor and pretty tasty without all the guilt!! Thank You So Much!!! I just made these! I had just finished up most of my greek yogurt this morning so I substituted the rest of it with coconut milk. They turned out great! Very dense, which I like. In hindsight, I wish I’d added some cinnamon or nutmeg. I’ll definitely be making these again. Such a healthy breakfast or snack option! good to know you can substitute with coconut milk! thanks! I’ve been making these regularly now for the last several months, and absolutely love this recipe. It’s so easy, and with grocery store ripe bananas at $1/bunch, you can’t go wrong. I’ve thrown in extra things every once in a while (walnuts, shredded coconut). Thank you! I just made these and they turned out beautifully. I found your recipe via Pinterest and made them last night. They turned out really well and so delicious for a healthy option! thank you for sharing this recipe – so easy and so delicious! Just tried these – delicious! Any tips for helping them come out of the paper liners a bit easier? I lost a lot of yummy muffin on the paper. I use the whoppie pan – making them muffing tops. My twins love them! i love that idea! so fun..and love that you have twins!! So yummy! We make these all the time! I don’t have a food processor so I just let the batter soak for a few minutes before baking to soften the oats. It comes out so chewy and soft. Thanks so much for sharing! I made these tonight and they are great. I might blend the oats by themselves for awhile next time in order to get them even smoother but I kind of like the chewy, oat texture that I got by just throwing it all in and going for it. I made enough for 24 muffins and I noticed that the second batch had a thicker batter due to the oats soaking up more of the liquid ingredients. 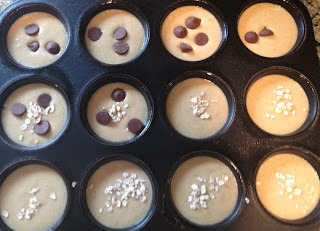 I will probably let the batter sit for 10-15 minutes next time before putting them into the muffin tins. We added a few dark chocolate chips and these are a hit! OH man…these are amazing!! Thank you so much for the recipe!! I made just a few changes, used only a 1/2 C of brown sugar and then chopped up strawberries and added them on top right before baking…YUM!! My kids and I gobbled them all up…thanks again!! I love the look of these muffins…no oil or butter is a super plus…think i might add a bit of cocoa to mine…thanks for the recipe…I’m pinning it so it won’t get lost! These taste great even after they’re frozen! I made them and wrote about the recipe here: http://theeconomicalhomemaker.com/delicious-oatmeal-banana-muffins-great-frozen-too/. I left out the sugar and they were still fantastic!!! I just wanted to led you know I made these using pumpkin in place of bananas and adding pumpkin pie spice for my son-in-law who is allergic to bananas. I made a bunch of the banana ones for my grandson and his mom. They love them and pull them out of the freezer for a quick snack or part of breakfast in the morning. Of course, I make them for me, too. Thank you!! I make these all the time and absolutely love them! My roommates keep begging me to make more. I made them in mini muffin tins and baked for about 12 minutes. Super easy and delicious! Thanks for the recipe! Can I use “quick cooking” oats instead of old fashioned? Thanks! Just came out of the oven and they are wonderful. Yum! Thanks so much for sharing! I love all the comments too, very helpful.I like the ideas of replacing the sugar with honey or maple syrup, and adding flax. Also love to comment someone made about using strawberries! I also added some cinnamon. just to let you know, for some reason the link for this on pinterest prompts a ‘spammy link’ warning. i braved it anyway… i have a thing for healthy banana muffins! going to give them a go! These turned out delicious! I made a few substitutions. I used fat free vanilla yogurt instead of the Greek yogurt. I used two egg whites and one whole egg instead of two whole eggs. I used applesauce instead of sugar. I also added some cinnamon. But your instructions don’t explain HOW to not eat them all in the first 10 minutes! ; ) Ah, to make them or not to make them, that is the question…. Thanks for the great recipe! I subbed blueberries for bananas (I just added them right before baking) and they came out amazing!!! This recipe is definitely a keeper! I’m a little late to the party but I just made these tonight… Followed the recipe to the T and LOVED these muffins!!!!!!! My new favorite!!!!!! Wondering if I could us this in an electric donut cooker.. I’m thinking of the comment about making pancakes. I’ve been trying to find a healthy donut recipe. I want a dense texture and the cake mix version just doesn’t work; too airy for me. I have a couple of comments about these. First, they are amazing. I’ve been looking for a good wheat-free/gluten-free banana muffin for a while. I’ve managed to do applesauce, zucchini, pumpkin, and peanut butter, but never a successful banana without a million strange ingredients. These fit the bill and I am in LOVE. Second, they do not need the sugar, at all. My blender was struggling so I completely forgot the sugar, but with butter and a tiny drizzle of honey or a little nutella, these are perfect and not cloyingly sweet like banana bread usually is. Third, my last half cup of oats wouldn’t blend in at all, so I just mixed them in whole and the texture they added was wonderful. Thanks again for this lovely recipe! Oh these look so good. I didn’t have any banana’s at home. So I used pears and added some nutmeg and vanilla. From my guys, I got a thumbs up and brilliant. The muffins where dense but good. These are SO good with vanilla greek yogurt instead of plain, and with chocolate chips and walnuts added! Can these be made ahead? I make these every week and mix them up in my Vitamix! They are terrific! I have substituted Nutella instead of sugar and they came out great. Periodically, I add blueberries or chocolate chips and am thinking of making some with applesauce, lemon and poppyseeds. This is a terrific recipe and easy to add substitutions. Thank you! Are you seeking good visibility to your talents and professional capacities on LinkedIn? The best option is thru Buying LinkedIn Followers, Connections and Endorsements. Are you serious to Buy YouTube Views? In this case, you’re on right page. We can be of help for you for this concern.